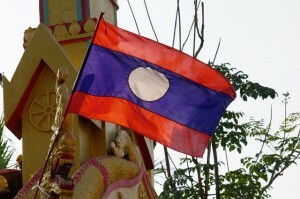 Due to the “Farang-friendly” policy of the Thai consulate in Vientiane, the Lao capital’s convenient location just across the border from Nong Khai in northeast Thailand (Isaan), and increasingly stricter visa regulations at other Thai consulates in the SEA region, Laos has become exceedingly popular with frequent “visa runners” from Thailand – and the Thai consulate in Vientiane accordingly busy. 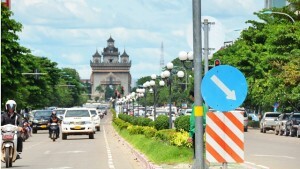 Due to increasingly stricter visa regulations at many Thai consulates in other Southeast Asian countries, Vientiane, the quiet Lao capital stretched out on the northeastern bank of a bend in the Mekong River opposite Thailand’s Nongkhai province, has become increasingly popular with “visa runners” from Thailand – especially those who don’t qualify for a “Non-Immigrant visa” of either type but wish to stay in Thailand for longer than just a few months. Unless you’re legally married to a Thai citizen, run your own business or legally work in Thailand, your best chances to stay in Thailand “long-term” are with an easy-to-obtain tourist visa. 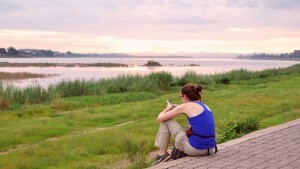 Due to the bad reputation of other consulates in the Southeast Asian region, Vientiane has emerged as the destination of choice for frequent “tourist visa runners” who wish to stay in Thailand long-term on the basis of an ordinary tourist visa. Why? Simple answer. Provided you “play by the rules” and visit a different consulate every now and then, there are virtually no problems with applying for back-to-back tourist visas from the Thai consulate in the Lao capital. 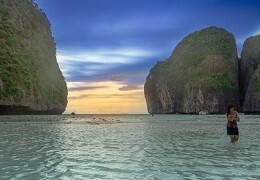 A single-entry tourist visa costs 1,000 Baht and is good for a 60-day stay in Thailand. This period can be extended for another 30 days at a local Thai immigration office (fee 1,900 Baht). Since 2007 double-entry tourist visa were available too. Unfortunately this has changed in November 2015 when double-entry visa were abolished altogether with the launch of the new multiple-entry tourist visa. 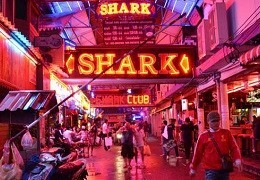 To put this straight: Foreign “tourists” who virtually “live” in Pattaya, or plan to do so, on the basis of back-to-back tourist visas may sooner rather than later face problems applying for a new visa. To start with: In a new crackdown on 60-day tourist visas enforced since 2009, several Thai consulates in the Southeast Asian region have become increasingly tougher on issuing back-to-back tourist visas. Repeat applicants, immigration announced then, would now face stricter screening measures to make sure they were actually “tourists” and use a tourist visa not as a way to work in Thailand illegally, in which case their application might get rejected. Since October 2009, this regulation has also been enforced by many embassies in the Southeast Asian region, including the popular consulate in Vientiane. “Suspicious” visa applicants reported back then that the consulate in Vientiane had started placing red warning stamps in their passports; others were given only single- instead of double-entry visas – or had their applications completely rejected. So what’s the situation in 2015? While in principle, there is no limit to how many tourist visas you can apply for consecutively, some embassies and consulates have set their own limit on how many back-to-back tourist visas you can get from them. The consulate in Vientiane, for example, currently has a limit of three back-to-back applications, after which, of course, you’re still free to apply for a fresh tourist visa at another consulate in the region (for example, Savannakhet) and come back to Vientiane after that. The biggest drawback though is obviously the launch of the new multiple-entry tourist visa (METV) which can be applied for only in the applicant’s home country. As a result, the formerly popular double-entry tourist visa has been abolished and is no longer available in Vientiane either. For more details on this controversial issue, please also see our dedicated tourist visa and visa news pages. How To Get From Pattaya To Vientiane, Laos? By Air – Fast and comfortable but relatively expensive. Flights leave only from Bangkok’s Suvarnabhumi and Don Mueang airports. By Train – Relatively comfortable and cheap but slow. Trains leave only from Bangkok’s Hua Lamphong railway station. By Coach – Relatively uncomfortable and slow but cheap. 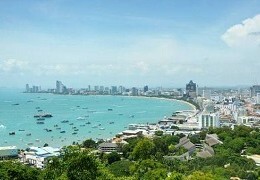 VIP buses leave directly from Pattaya. A one-hour flight from Bangkok’s Suvarnabhumi Airport is obviously the most comfortable and fastest way of getting to Vientiane. On the downside, it is also the most expensive alternative. 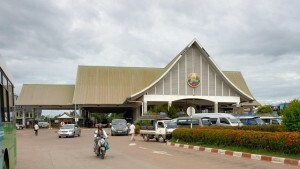 Vientiane’s Wattay Airport, some four kilometres from the city centre, provides only limited services between Thailand and Laos. Direct flights to Vientiane also come at rather expensive fares. 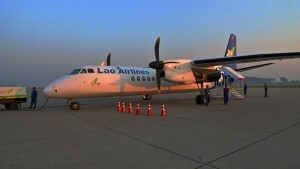 THAI Airways and Lao Airlines, the national carrier of Laos, both operate two daily flights each from Bangkok (Suvarnabhumi Airport) to Vientiane. For rates and up-to-date timetables, please check their websites. A cheaper and therefore more popular alternative is a domestic flight to Udon Thani. Udon Thani’s airport is located only about 50 kilometres from the Thai border post in Nong Khai. Direct shuttle service by bus or minivan from the airport (exit door) to Friendship Bridge costs approx. 150 Baht. There are half a dozen of daily flights between Bangkok and Udon Thani. Apart from Thai Airways, you have the choice between the two low-cost carriers Thai AirAsia and Nok Air. As with all budget airlines, the earlier you book, the cheaper is your flight; with one-way rates starting at less than 1,000 Baht. Please note, however, that the advertising fare, due to additional taxes and surcharges, is just a fraction of the price you actually have to pay for the flight. Thai AirAsia departs from Bangkok’s old Don Mueang Airport several times a day and arrives in Udon Thani about an hour later. Nok Air also departs from Don Mueang Airport several times a day. THAI Airways departs three times a day from Suvarnabhumi. Please check their websites for up-to-date information, flight schedules and fares. A train ride from Bangkok’s Hua Lamphong railway station to the northeastern city of Nongkhai, located directly at the Lao border, is a relatively cheap and – depending on which class you travel – also comfortable alternative for people who don’t like flying. Nongkhai’s railway station is conveniently situated within 10-minute walking distance from the immigration checkpoint at Friendship Bridge. If you opt to take a tuktuk (at a flat rate of 30 Baht) it won’t take you more than five minutes to the border crossing. On the downside, as Thai trains are rather slow (regardless of whether you take a “rapid” or “express” train) you should expect the trip to Nongkhai to take a minimum of 11 hours, provided your train arrives in time? Passengers can choose between 3rd-class coaches (no air-con), 2nd-class coaches (available options include air-con, fan, sleeper berth, upper bed or lower bed) and 1st-class travel. It’s advisable to book a ticket in advance to secure a seat and sleeper berth in the desired class. Advance booking is also possible at Pattaya’s railway station on Soi Siam Country Club (off Sukhumvit Road). There are three daily trains from Bangkok’s Hua Lamphong station to Nongkhai, all departing in the evening. 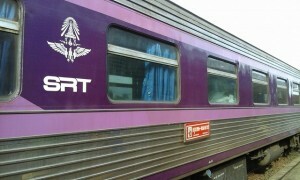 We’d recommend you to take the 8 p.m. “express” train which is scheduled to arrive in Nongkhai at 6.45 a.m. As of October 2015, a lower berth in the second-class aircon carriage will cost you 758 Baht one-way. For details, fares and timetables (which may change from time to time), please visit the State Railway of Thailand website, or simply ask the friendly guy at Pattaya’s little railway station. When traveling from Pattaya, Hua Lamphong railway station can be reached most conveniently by public bus from the terminal on North Pattaya Road (Sukhumvit end). The bus ride to Bangkok’s Ekamai bus station on Sukhumvit Road takes approx. two hours and costs around 120 Baht. Buses leave every 30 minutes from around 4.30 a.m. till late evening. 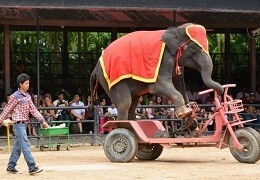 From Ekamai, Hua Lamphong can be reached easily by skytrain (BTS) and subway (MRT) in approx. 30 minutes. From Ekamai BTS Station on Sukhumvit Road (just a few footsteps from the bus terminal) you simply take the skytrain to Asok Station (stations will be announced in both Thai and English). From there, just follow the exit signs to MRT Sukhumvit station and take a subway to Hua Lamphong, which is the last stop. All you need to do now is follow the exit signs to the railway station. 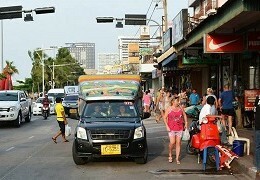 From the railway station in Nongkhai, it’s a less than five-minute tuktuk ride to the border post at Friendship bridge. As of 2009, there’s also a connecting international shuttle train via the new Mekhong river rail link from Nongkhai straight to the new Thanaleng rail terminal in Laos, some 13 kilometres short of Vientiane. 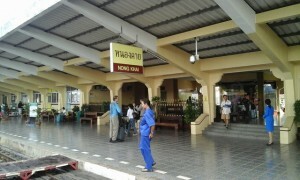 Visa-on-arrival for Laos are now also issued at Thanaleng station (source: Seat61). The 11-hour bus ride from Pattaya to Nong Khai, regardless of whether you travel on an air-conditioned VIP coach or not, is surely the least comfortable transport option there is, especially for XXL-sized Westerners. On the other hand, a bus ride is cheap and coaches leave directly from Pattaya. Public bus service, with “relatively” comfortable air-con VIP coaches, from Pattaya to the northeastern provinces of Isaan (Nakhon Ratchasima, Khon Kaen, Udon Thani and Nongkhai) is provided by the 407 Pattana bus company. 407 Pattana, serving the busy Rayong-Udon Thani (Nongkhai) route, operates a little bus stop at the Petronas gas station on Sukhumvit Road, just around the corner from Pattaya Klang (Central Pattaya Road). The bus stop also has a ticket office and a waiting hall. Air-conditioned VIP buses depart a dozen times daily and stop only at major bus terminals along the way (including an approx. 20-minute stop in Khorat where you’ll be handed over a voucher worth 20 Baht that may be used for purchasing a meal in the terminal’s food court.) If there aren’t enough passengers on board who continue their journey to Nong Khai, you may be required to change the bus in Udon Thani. A few buses leave in the morning hours. From afternoon till approx. 10.30 p.m. VIP coaches leave around every 30 minutes. If you plan to visit the Thai consulate in Vientiane the following morning (visa application before noon) a night trip is recommended anyway. The 11 to 12-hour bus ride to Nong Khai costs around 600-700 Baht. Advance booking is highly recommended, especially if you travel over public holiday periods. For exact departure times and fares, please call their Pattaya office at 038-421 535. If you travel from or via Bangkok, VIP buses to Nong Khai depart frequently from the Morchit bus terminal in the north of the capital. Once you have arrived in Nong Khai’s it’s just a 10-minute Tuktuk ride from the bus terminal in the city centre to the border post at Friendship bridge. The trip shouldn’t cost you more than a maximum of 100 Baht. Note: If you haven’t got a visa for Laos yet (which we assume you haven’t) many Tuktuk chauffeurs will try to take you to some kind of “visa office” halfway between the bus terminal and Friendship Bridge where they claim your visa would be arranged at a “cheaper” fee than at the Lao border post. But while having a visa in advance certainly speeds up the process at the border, this service is actually slightly more expensive than the regular visa fee. So if you don’t wish to use this “cheap” visa service, simply insist that your Tuktuk chauffeur takes you straight to the bridge; a visa-on-arrival, as the name says, is easily available upon arrival at the Lao border post. Hi I would like to fly to Vientiane to get a non b for work permit, please send me contact number as so I can book with you. Sorry we’re no travel agency so you’ll have to book your flight elsewhere. For hotels and guesthouses in Vientiane you can find good deals at the Agoda website. I would recommend you to stay near the Mekhong riverside (where most of the little “action” takes place that you can find in Vientiane) or near the Thai consulate (that’s if you don’t plan on going out much). As for flights to Vientiane: If you want to fly directly to Vientiane there’s only Lao Airlines flying that route from Bangkok, and they’re rather expensive. Most people going on a visa run-by-air prefer to fly to Udon Thani with a budget airline like Thai Air Asia and then take a minivan from Udon Thani airport to the Lao border – a lot cheaper and not much more time-consuming. I’m scheduling a bus from Bangkok to Nong Khai, and was wondering what an ideal time to arrive would be. I’m guessing the Lao border post may be only open certain hours, so I didn’t want to book a bus that arrives too early if so. It always depends on how busy it is but if you arrive at the border not later than 9 a.m. you should be fine and get to the Thai consulate in time (that’s assuming it doesn’t take more than an hour to exit Thailand and get your Lao visa on arrival.) A bus that arrives in Nong Khai at 8 a.m. or so should be ok. Anything later than that would be risky – that’s unless you want to spend more than just a night in Vientiane anyway?